I culled and mulled this list because I wanted it to be genuinely valuable to you and not a popularity contest. (Some of that will always exist, I suppose, given the nature of social media!) Creating this list, like last year, was difficult. There are so many people and resources I turn to for great content and advice. The other thing that happens, very much like with performance reviews, is that I tend to remember the more recent exchanges more than those from the beginning of the year. To cover my bases, let me remind you to check out last year’s list of 99 people to follow on Twitter. I still follow and recommend all those people! And these were (and still are) the top 11 blogs from 2012-2013. There are tons of lists out there! 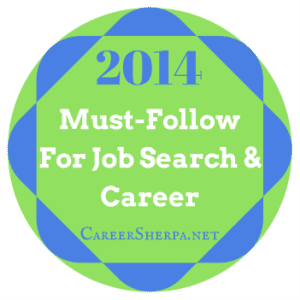 Please don’t tell me you don’t know where to go to find job search or career advice! Add these sites to your reader, join their free email lists, or follow them on your favorite social network! You’ll probably get all your questions answered! This list will continue to grow as the new year unfolds! Did I miss any sites or people?